Gymnasts and their coaches can be exposed to high levels of flame retardants, which are in pit cubes and landing mats of most gyms. Levels can be reduced by replacing the foam pit using flame retardant free foam and preferential purchasing of flame retardant free landing mats and other equipment. Gyms can also implement a hand-washing policy and take precautions when cleaning the foam pit. Each box delineates the 25th to 75th percentiles, the central line indicates the median, and the error bars indicate the minimum and maximum serum concentrations. 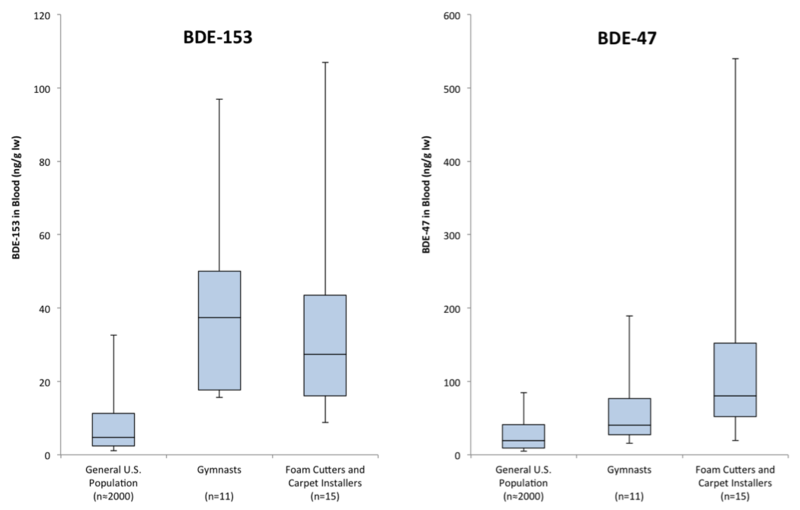 High levels of flame retardants have been found in the foam, air and dust of gymnastics training facilities in the United States. Levels in gym air and dust can be 1-2 orders of magnitude higher than levels in homes, offices or vehicles. Foam in the pit and landing mats are the main sources of flame retardants in the gym. Flame retardants are chemicals that are added to products to meet flammability standards. There are many types of flame retardants and they are used in many types of products including electronics casings, building insulation and polyurethane foam. Pit cubes and landing mats contain polyurethane foam, as does most upholstered furniture and many baby products. Flame retardants are no longer used in the foam of residential furniture or baby products due to environmental and health concerns. Gymnastics equipment without flame retardants have become increasingly available. Because flame retardants are not chemically bound to foam they migrate into air and dust through volatilization and degradation. This occurs even when the foam is covered by fabric or leather upholstery, and occurs throughout the lifetime of the product. Covering the foam will somewhat slow this process, but will not stop it. Figure 2. 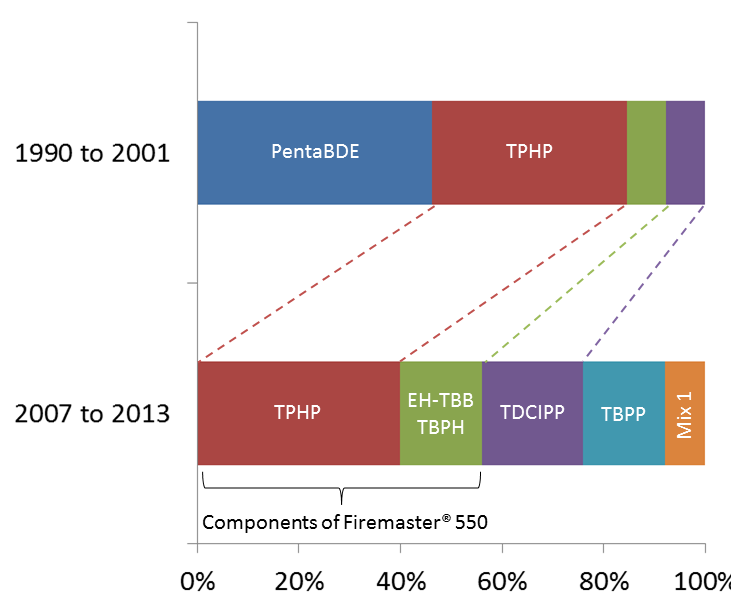 (Click to Enlarge) Types of flame retardants in pit cubes from U.S. gymnastics training facilities before and after the 2005 phase out of PentaBDE. Carignan CC, Fang M, Stapleton HM, McClean MD, Heiger-Bernays W, Webster TF. 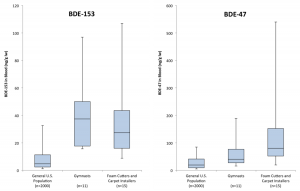 Urinary biomarkers of flame retardant exposure among U.S. collegiate gymnasts. Environ. Int. http://www.ncbi.nlm.nih.gov/pubmed/27395335. Dembsey NA, Brokaw FM, Stapleton HM, Dodson RE, Onasch J, Jazan E, Carignan CC. Intervention to reduce gymnast exposure to flame retardants from pit foam: A case study. Environ Int. 2019. Stapleton, H. M.; Sjödin, A.; Jones, R. S.; Niehser, S.; Zhang, Y.; Patterson, D. G., Serum levels of polybrominated diphenyl ethers (PBDEs) in foam recyclers and carpet installers working in the United States. Environ. Sci Technol. 2008, 42, (9), 3453-3458. Broadwater K., Ceballos D., Page E., Croteau G., Mueller C. Evaluation of occupational exposure to flame retardants at four gymnastics studios. Health Hazard Evaluation Program, National Institute for Occupational Safety and Health, Centers for Disease Control. September 2017, Report No. 2014-0131-3268.